The choice of a church is usually based on a religious beliefs of either the bride or groom, or both. Many couples simply choose to be married in the church they are currently attending or in the church either family may have attended. 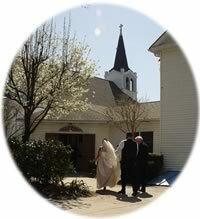 The person who will witness the wedding vows is often based at that church. The couple will work with this clergy person on all the details of their ceremony, and any needed requirements the church may have such as premarital counseling, Baptism, or membership in the church. Couples desiring a religious ceremony without a particular church in mind, must try to find a church that will marry non-members or begin a relationship with a particular church or clergy member. Some churches offer non-denominational ceremonies. If a particular religion is desired, the couple should search out churches of that faith and immediately talk to the clergy members to learn about the requirements for marriage within that particular church. For couples not wishing a church ceremony – many other alternatives are available. Public parks or gardens allow ceremonies or formal wedding pictures to take place on their grounds. Some reception sites may also make accommodations that include a ceremony. When planning the music for the ceremony it is best to check with the clergy member at the church to understand the church's rules about what kind of music is expected or allowed during the ceremony. Discuss what specific types of songs are appropriate to each part of the ceremony. The traditional church wedding usually employs an organist or pianist, who is sometimes accompanied by a vocalist for one or two songs. Organists and pianists can be joined by other musicians at wedding ceremonies. Some variations include church choirs, brass ensembles, madrigal singers and instruments such as the flute, guitar, harpsichord, trumpet, violin, cello and harp. If you have special song requests, or have a family member or friend who wants to be a part of the music during the ceremony, you need to discuss that with the church's musician ahead of time so that practice times can be worked out. Almost every wedding musician encourages the engaged pair to stay open-minded about songs and music choices. The prelude. This provides appropriate background music while the guests are being ushered in and helps to set the desired mood for the wedding. Generally, the prelude begins 30 minutes before the processional. The first solo. A song that also helps establish the mood for the ceremony, usually sung after the bride's mother is seated. The processional. The traditional song of announcement, played while wedding party and the bride walk to the altar. The second solo. Played immediately following the recital of the vows, this is a personal, meaningful song that is special for the bride and groom. The recessional. This should be a lively, celebratory piece heralding the union of the new couple. A postlude. The postlude continues at the end of the ceremony as the guests are ushered out. In some locations, the postlude can be heard in the receiving line. Outdoor weddings are nothing new, but they are becoming more popular. Even in areas, where winters are cold and unpredictable, the beauty of nature is unsurpassed. Outdoor sites may be as close as your own backyard or a nearby city, county, or state park. If you are considering a site that does not have a shelter of some kind, never fear. Rental companies will deliver a tent to the site you choose. The choice of a tent can set the stage for a unique wedding celebration. Tents can be set up almost anywhere! For more unique ceremonies, often special vows are written. You should with the officiant whether any particular wording should or should not be included. The officiant may also be able to help by referencing ideas from past weddings that they have performed. The actual vows may be anything that the couple desires to share in declaring their heartfelt message to the one that they love. For church weddings, the couple should discuss with the clergy member any specific wording they may want to use in their vows. While some churches may allow couples to include their own vows, other churches may not. Besides writing unique vows, or choosing a special wedding site, there are other ways to personalize a ceremony. Special touches including decorations can add a personal touch to even the most traditional of weddings. Elegant bows, balloon arches and flowers can change the atmosphere of any location. Proclaiming the new union of a husband and wife may be celebrated as the couple leaves the ceremony  greeted by their guests blowing bubbles or to a release of dozens of helium balloons. How about taking the celebration to new heights? Companies specializing in dove releases can provide a breathtaking touch to the union. Pure white doves joyfully rise as a testament to the new marriage - symbolizing love, hope, peace and harmony. Releases can include two doves, romantic and sweet, or ten to twenty doves to fill the sky for a fairy tale beginning to married life. Available for release year-round, these doves are not left defenseless in the wild, they return directly to their aviary and never linger at the site. Want to start marriage off with a bang? Pyrotechnicians (fireworks specialists) can light the night sky with a variety of colorful bursts sure to leave guests oohing and aahing! Spending time together with the wedding party is a great way to enjoy the entire wedding day but can also cause havoc moving from place to place. Many wedding parties of today include a large number of bridesmaids, groomsmen and ushers. Luckily transportation businesses are available to accommodate these large groups. Whether going from the wedding site to the reception site or for a pre-wedding fun night out on the town, there are a variety of vehicles now available to choose from. Traditional limousines remain a popular mode of transportation. Limousines offer many luxurious options and have a variety of special features sure to make traveling in style fun too! Limousines are available in wedding white or elegant black. Many limousines provide the comfort of leather seating and features like televisions, stereos, bars and special lighting. Some companies even have special colors available. Buses have also become a popular way to move large wedding parties from place to place. The choice of available styles and sizes vary greatly. From luxurious motor coaches to mini-buses, these vehicles are as different on the inside as they are on the outside. For a nostalgic feel, a trolley provides the festive appearance of an era gone by with the room to sit back and celebrate while on the go. These vehicles evoke a fun feeling even before you hop aboard. No matter what type of transportation is chosen, getting there together is a great way to share a fun-filled day with those closest to your heart.